Many of you may not be aware that late in 2015 we acquired a “new”/”old” office building in Green Bay, Wis.
“New” in that we did not own it. “Old” in that we previously owned it. It served as our corporate headquarters from 1982 through 1993 before we moved to our new, larger facility at 3101 South Packerland Ave., about a mile and a half away. When we reacquired the property, we were pleased to see that our founder and former CEO Al Schneider’s office was completely intact. Much like we had set aside the last office Don Schneider (Al’s son, and former Schneider CEO) occupied in the Corporate Business Center, we quickly decided that it was the right thing to set aside the last office Al Schneider occupied in the Ridge Business Center. 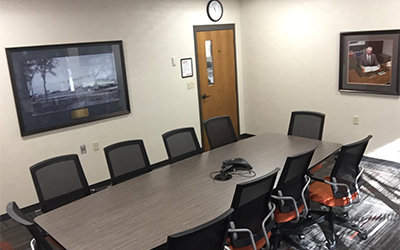 The Al Schneider Conference Room, located in the upper south corner of the building, features a prominent photo of Al, an inspiring reminder of Schneider’s roots when Al sold the family car to buy his first truck in 1935. We welcome each of you to stop in and check out the Al Schneider Conference Room the next time you visit the Ridge Business Center (2737 South Ridge Road). We have locations across North America. Check out all of the Schneider locations and see what each of them has to offer. Steve Parent is the Vice President of Corporate Facilities/Purchasing at Schneider. He has responsibility for real estate, project management/construction, facility maintenance, corporate purchasing and related support services. He has been active with the International Facility Management Association since 1991 and has served in several other professional and volunteer capacities. After receiving his Bachelor of Science degree in electrical engineering from Michigan Technological University, he has enjoyed a 38-year career with Schneider. He enjoys cheering for the Green Bay Packers and spending time with his wife Cindy and two sons.